Creating a strong accessory wardrobe need not be overwhelming. Like most things, starting with great, classic selections and building from there is the strategy for success – also gorgeous ears. The pearl stud. Timeless in style this earring can go from the grocery store to the boardroom to a PTA meeting and a night on the town without batting a well-groomed eyelash. Pearls are not just for Muffy and the preppy set – pair this with a great leather jacket for that interesting ying-yang of tough and feminine. The diamond stud. Or it’s favorite cousin, the cubic zirconia. Either way it’s a simple and elegant way of elevating an outfit without going overboard. It can be casually chic or sparkingly elegance – and who doesn’t love a touch of sparkle? The hoop. This is the workhorse of any good earring collection. Silver or gold it doesn’t matter. It a simple, face-framing earring that isn’t heavy or overpowering and every age can wear it. Keep it a reasonable size so you aren’t compared to a gypsy fortune teller. The delicate chandelier. This is that great earring that’s not too dressy or overwhelming, but you want a little something special on the neck. Easily transitions from day to night – I like this one’s openness. The pop of color. A woman cannot live by gold and silver alone. There are times when a flash of color near the face is called for. I find turquoise endlessly flattering and, given the appropriate setting, not locked into a rodeo or southwestern flavor. The evening chandelier. Low lighting, low cut dress and long eyelashes? This requires the volume and sparkle to be turned up a bit. Cocktails and weddings call for a bit of glam. 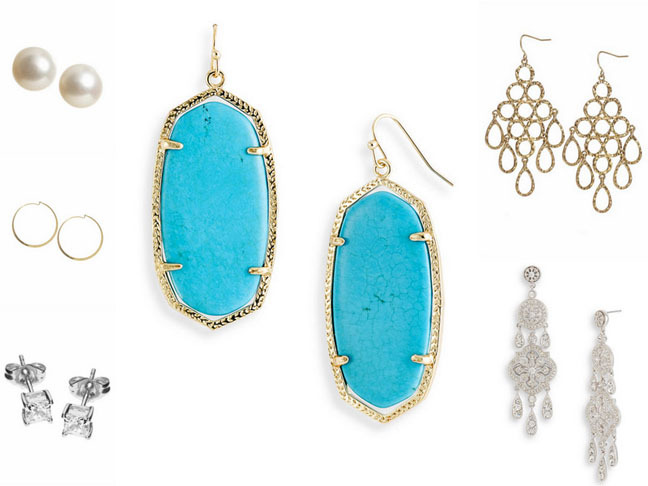 Be ready – and have a pair of earrings that can accompany any dress or ensemble.